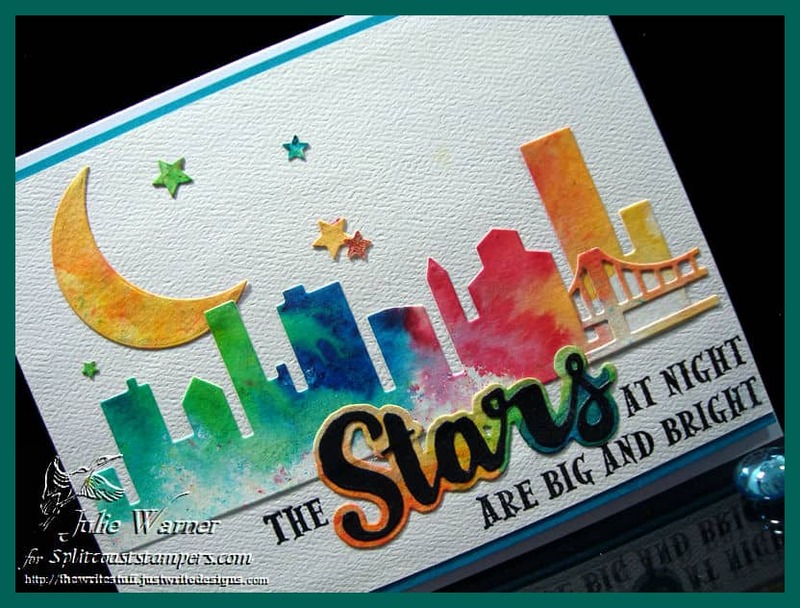 To make my Corpus Christi (aka: Sparkling City by the Sea) skyline card, I made a bg w/ Brushos then die cut the silhouette skyline. 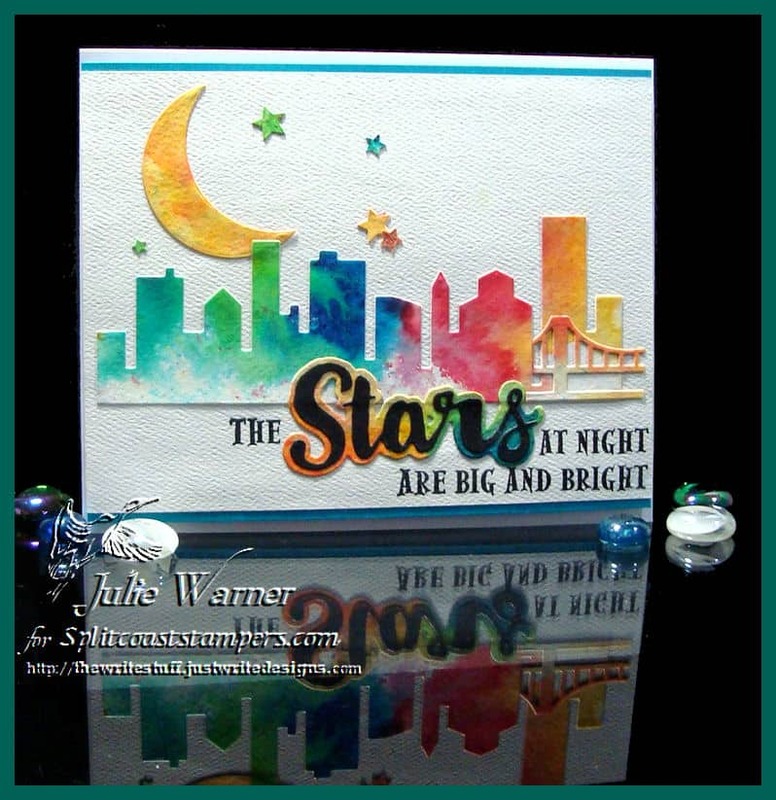 I used another skyline die that had a bridge (because Corpus has the big Bay Bridge) & added a piece of it to the right side. 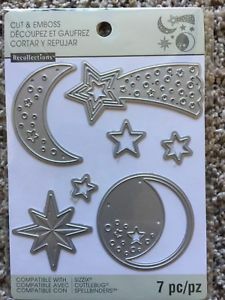 I also die cut the moon & stars & the Stars word to insert it into the greeting. 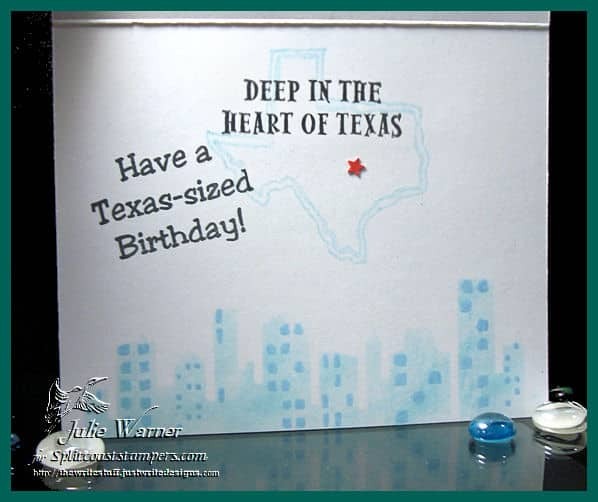 The inside of the card has the “Deep in the Heart of Texas” part. Now all you fellow Texans (& a few who want to be, lol) will be singing that song. You’re welcome!! Thanks so much for stopping by! Have a great weekend, y’all! 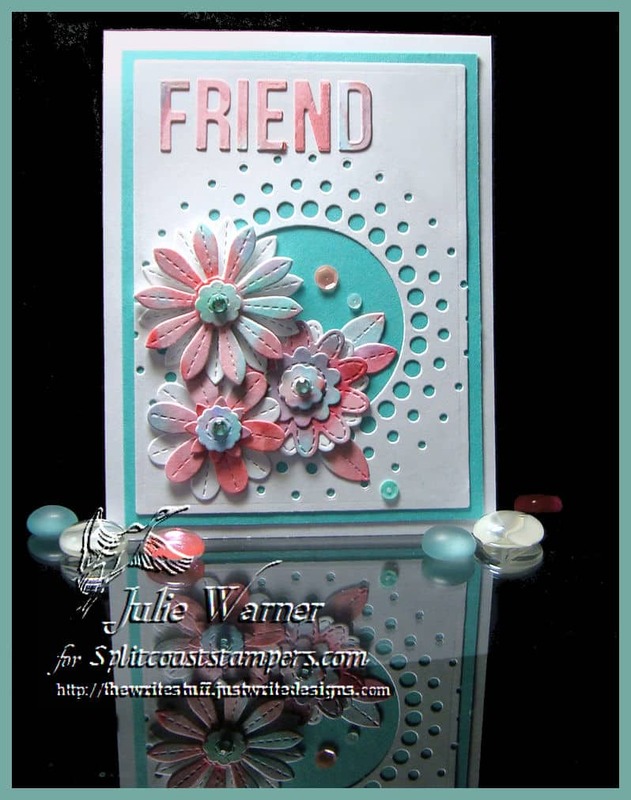 Congrats to Mary, the newest Featured Stamper (FS596) on Splitcoast! She has lovely gallery & I chose THIS to case. 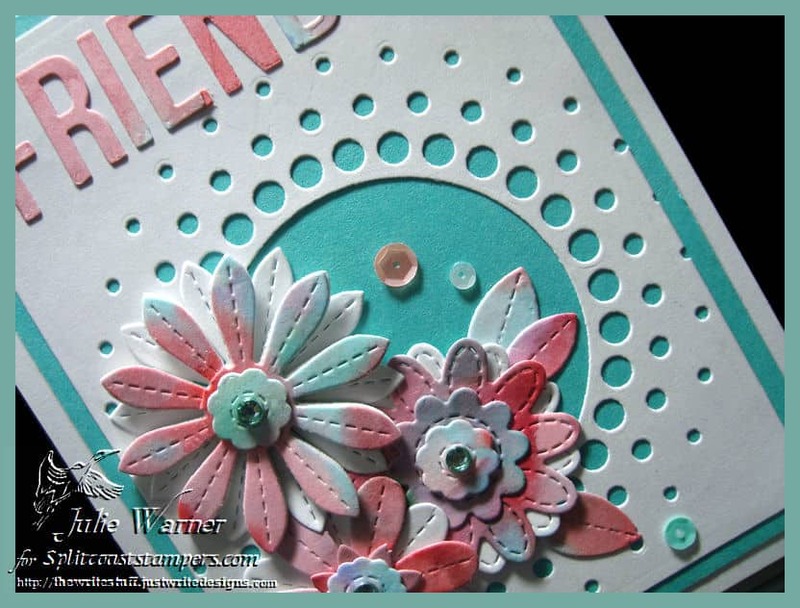 I kept the Friend & flower theme & layout, but I used different colors, die cuts instead of stamps & a circle opening instead of an oval. The colors on my flowers came about when I was refilling some Copics the other day. I noticed the inside of some of the caps were a total mess so I poured a little 91% isopropyl alcohol into them & thought it was a shame to waste all that color. So I poured it out onto a white piece of card stock. 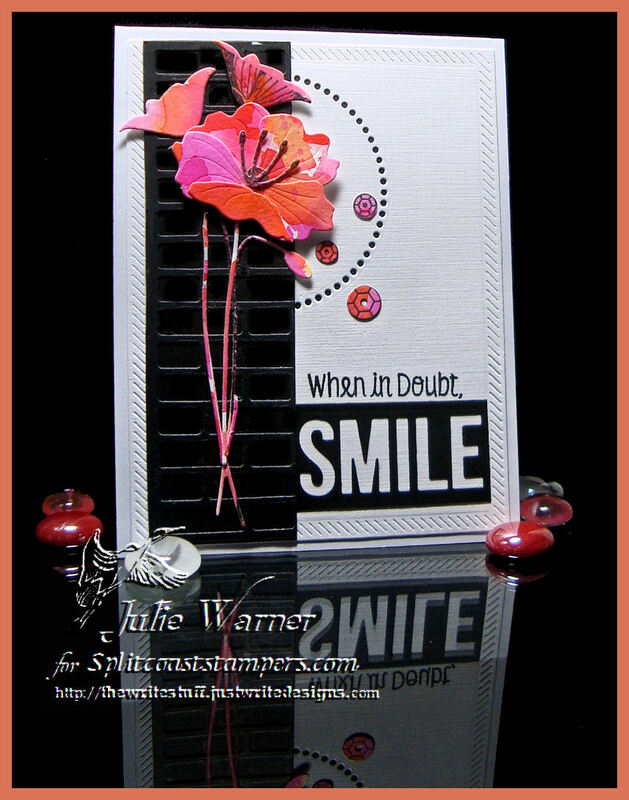 I liked the way it looked so I used it for the flowers & greeting. 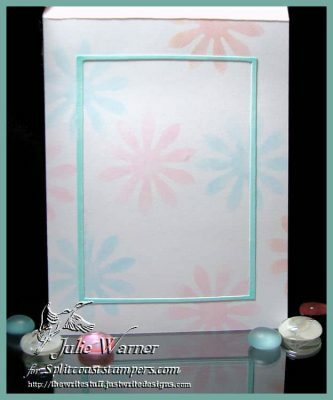 The lg circle burst was die cut into the white & a turquoise layer put behind. Then all I had to do was arrange the flowers, add a few sequins & some Copic tinted crystals. I will mention in case any of you have trouble (like I do) getting the letters straight…I left the letters in the die, added tiny dots of glue to the backsides, then turned the die over onto the c/s & pressed thru the die holes to release. Worked like a charm! Here’s a look at the inside. I used the negative of one of the flowers as a stencil. 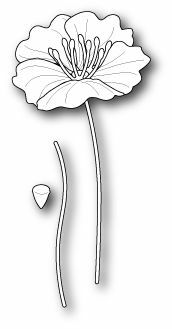 The Clean & Simple Challenge on Splitcoast (CAS477), was to use Poppies in honor of Anzac Remembrance Day. It’s a day in Australia & New Zealand similar to our Memorial or Armistice Days. I love poppies & my card is made up of a lot of leftovers so it went pretty fast. 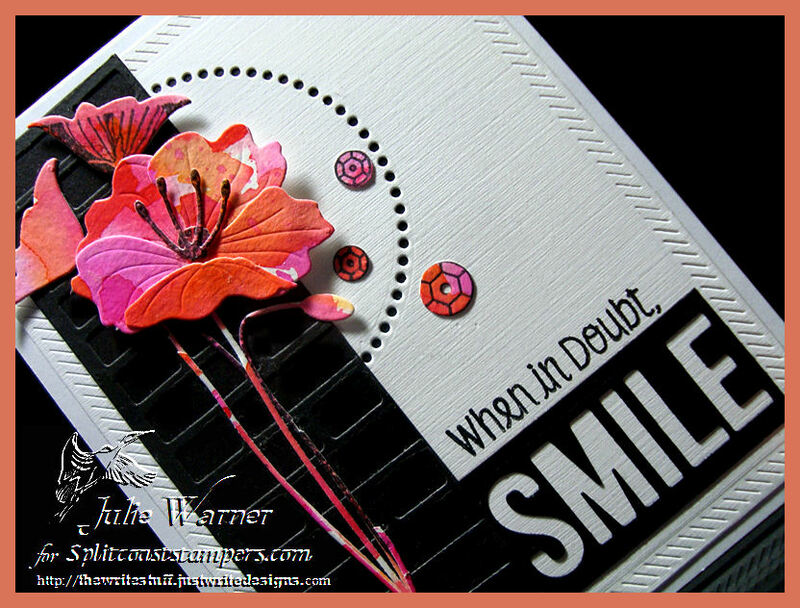 The poppies were die cut out of leftover watercolor bg, the Smile & brick bg were die cut out of leftover strips. I think the only new piece was the white linen bg. 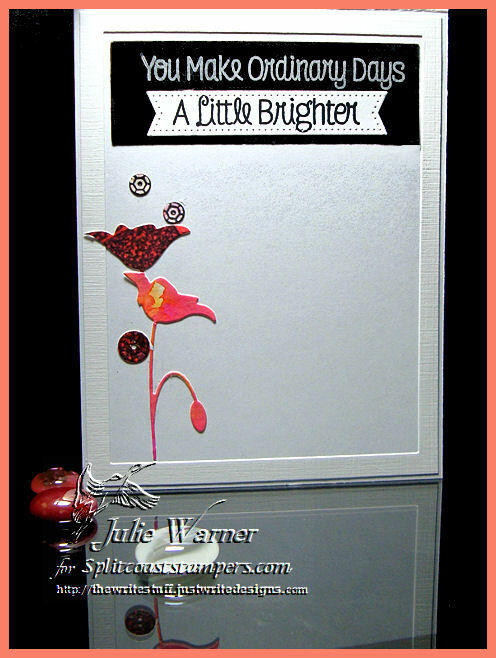 I used a semi-circle die (Blueprints 21) to cut out the frame around the poppy & added a few stamped & die cut sequin images.